PinkyPiggu: BEST 5 Unforgettable Meals of 2012 & More in 2013! BEST 5 Unforgettable Meals of 2012 & More in 2013! Year 2012 has been a year of delightful gastronomical journey for me! It's an open secret among friends who know me that the way into my heart is always food. I'm not one who drink or club or adventurous for outdoor activities, but mention food, you'd see how my eyes light up almost instantly. Most meetups with friends centered around food outings and some meals are simply unforgettable. Fantastic company, tasty food, great ambiance, impeccable service, all of these makes together an awesome dining experience which lingers on way beyond after the meal is over. 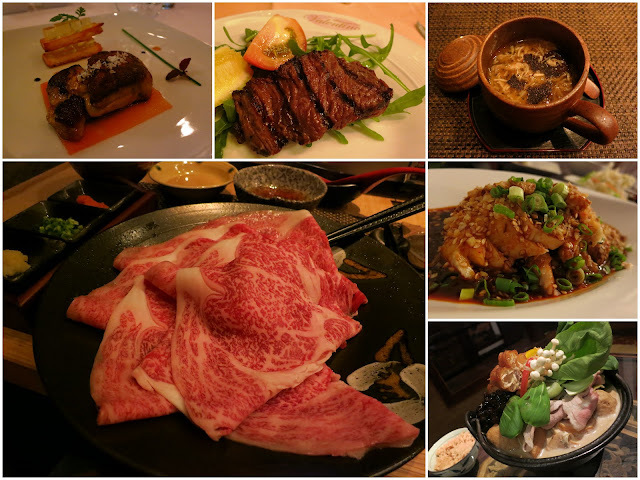 As I recap my Best 5 Unforgettable Meals of 2012, I look forward to even greater ones in 2013! May 2013 be an awesome year of great food in abundance for you! Ask me where is my favorite place for beef and I would not hesitate to answer: "Fat Cow"!!! Oh my, not only is this cow fat, it's impressive to the max! Choose your preferred cut and have it cooked the way you want ~ shabu shabu, charcoal grilled, teppanyaki or sukiyaki. Be warn of the steep prices though, premium meat comes with a equally premium price tag. Prices aside, indulgence rules when it's time to give this PinkyPiggu's tummy a treat. The excellent marbling and delicate flavor of the wagyu from Kagoshima prefecture is perfect for swishing in shabu shabu, and waste not the sweetened leftover broth which was made into a simple but most luxurious tasting porridge. Each piece of my charcoal grilled Australian ribeye is meltingly tender with slightly charred edges and perfumed with a smoky aroma. I experienced L.O.V.E at every single bite. The gravy accompanying the braised ox tendon and pan seared foie gras is so rich and tasty, I've to refrain myself from licking the bowl clean. Chawanmushi, the very simple dish of steamed egg tofu is upped to aristocrat status immediately with a touch of black truffles. Everything I ordered that evening, from starters to main to desserts to cocktails, none of it disappoints. Ever heard of the term "foodgasm"? This is the very epitome of it! Apart from the numerous awards, this beef also boosts the most tender texture. The signature intense marbling also gives the meat a subtle sweetness. Thinly sliced beef quickly immersed in a delicate simmering broth, retaining all the beautiful natural flavours. Made from the sweetened leftover shabu shabu broth, this is the most luxurious tasting porridge! Australia’s premium pure-blood wagyu with fine and evenly dispersed marbling and a pronounced beef flavor that lingers on the palate. The first thing about Halia that impressed me is the impeccable service. As I approached the beautiful restaurant set among the lush greenery of Singapore Botanical Gardens, the greeter welcomed me with a warm smile and ushered me to the al fresco area of the restaurant where I enjoyed their specialty drink of sun-dried ginger and wild mountain honey. The drink is very cool and refreshing, even more so as I had a walk in the gardens before arriving. The servers were very knowledgeable about the food and are able to answer my questions effortlessly. Service is very attentive but not intrusive. Did I mentioned that the server addressed me by my name throughout the whole evening? "Miss Nicole, would you like... Miss Nicole, this is....". It is a nice touch which made a guest feel special, the only other time when I experienced similar service was when I flew SQ Business. The food is notable for marrying European traditions with Asian touches. I had a great time enjoying each dish and trying the very unusual Halia's Rojak. Halia would be the place! Helmed by Celebrity Chef Eric Teo who is a familiar face in the local culinary scene, The Red Chef is a restaurant serving home styled dishes at wallet friendly prices in the western heartland of Singapore. The location may be too remote for some, but no where is too far for us to travel in this tiny island. My two friends and I visit the restaurant one evening when Chef Eric was there and it turned out to be a very memorable visit of catch-up conversations, laughter and of course, good food! Nothing can be faulted of the few dishes which Chef Eric had recommended. I particularly enjoyed the Manuka Honey Pork Spare-ribs, which underwent hours of marinating, steaming, deep frying and braising before making its appearance on the dining table. The result is ribs of a most juicy bite and tender texture, deeply flavored and paired with a sweet, tangy, appetite whetting sauce which went great with my bowl of white rice. Despite his celebrity chef status, Chef Eric is so humble as he went around chatting to the diners and acceding to photos requests readily. I see him even helping to clear the tables together with his workers! The Red Chef is currently taking a break at the moment, but I believe Chef Eric would be back with something even better. Let's all look forward to it! This is my favorite place for Italian food! I excitedly checked out Ristorante Da Valentino's new premises at Turf City Shopping Mall one evening, and fall in love with it all over again as I experienced once more the awesome food and warm hospitality which has remained consistent throughout these years. The restaurant is furbished like an Italian home, creating a warm and inviting ambiance. Headed by Chef Valentino and with his sister, Perla, heading the pastry boutique, alongside with family members helping in the kitchen and dining area, it is indeed an Italian affair! For authentic Italian food in a homely setting, look no further! Bubble Milk Tea Hotpot ~ 珍珠奶茶火鍋, a weird sounding dish which elicits strange looks and reactions whenever I tell my friends about it. But trust me, this little hot pot overflows with much more goodness than it sounds. The chewy black pearls (which you always find in your bubble tea drink) is coupled with a savory milk and pork broth. Infused with soft, aromatic afternotes of tea, the light creamy soup goes amazing well with the array of accompanying ingredients which you always find in your usual steamboat. This turns out to be a highlight of my Taiwan trip.